Low thyroid function leads to weight gain but not how you think. If low thyroid leads to weight gain then why does replacing thyroid hormone in your body not lead to excessive weight loss? It turns out that this phenomenon can be explained but you have to understand the function of other hormones in your body. Thyroid hormone is involved in so much more than just monitoring your metabolism and its the effects on other hormones that cause the weight gain you associated with hypothyroidism. ​Does hypothyroidism actually lead to weight gain? The question seems so simple if you have hypothyroidism because no doubt you probably experienced "unexplained" weight gain as one of your main symptoms. ​But if hypothyroidism leads to weight gain then why don't you lose weight when you start thyroid medication? Doesn't it make sense that if your weight was due to low thyroid that replacing that thyroid would result in some lost weight? This happens with pretty much everything else in medicine. If you have high blood pressure and you take blood pressure medication then your blood pressure will return to normal. The same is true with cholesterol, blood sugar, etc. If you follow the logic above that low thyroid leads to weight gain, then maybe you aren't getting enough thyroid hormone in your medication. This turns out to be true (but we won't go over that today) especially if your Doctor is treating you by your TSH alone (which is a terrible marker for tissue level thyroid status). But let's assume that you are getting enough thyroid hormone replacement. ​Maybe, just maybe, our traditional understanding of hormones and weight gain is not accurate. It turns out that this is probably the biggest reason for why thyroid hormone causes weight gain in individuals and helps explain why patients (probably like you) don't lose weight when you replace the thyroid hormone. Weight gain is not a result of hypothyroidism. You may have heard this from your endocrinologist or primary care provider. Why do you think they are saying that to you? Because after treating hundreds (if not thousands of patients) how can you justify the fact that none of your patients are losing weight on thyroid medication? In fact, studies have come out to show that using T4 therapy in patients who are overweight actually doesn't lower their weight (1). The only explanation they can come up with is that thyroid hormone doesn't cause weight gain. And this is so far from the truth. ​The association between weight gain and hypothyroidism is somewhat complex and includes much more than just your thyroid. The easiest way to think about this is to realize that everything in your body is connected. You can think of this connection like a spider web. When one string is pulled, it pulls the entire web. Meaning you can't really change one thing without affecting several others. This is true of thyroid hormone as well. As thyroid hormone levels fall it causes a chain reaction which changes multiple other hormonal systems in your body. And guess what these systems do? They all contribute to your weight! 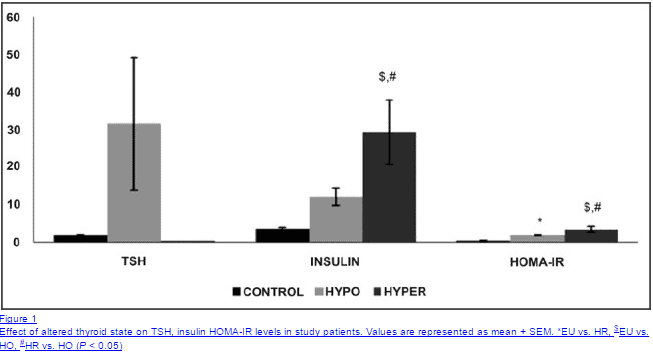 The connection between high insulin (and high blood sugar) and weight gain (2) has been well established. What you probably don't realize is that this connection extends to patients without diabetes or pre-diabetes as well. Patients with highly elevated levels of fasting insulin (and by my personal prediction this is about 50%+ of patients in the US based on serum testing) still have weight gain problems. ​So we know that high levels of insulin (and high blood sugar) lead to weight gain, but what you probably don't know is that thyroid hormone influences insulin resistance. Low (and high) levels of thyroid hormone lead to the condition known as insulin resistance. This connection is so strong that low thyroid hormone can actually lead to type II diabetes (3). Replacing thyroid hormone in your body doesn't take care of this hormone imbalance! That means you can replace your thyroid hormone, but you will still have insulin resistance. This is one of the many ways that hypothyroidism leads to weight gain and the treatment of hypothyroidism does NOT lead to weight loss. Bottom line: Low thyroid hormone leads to high blood sugar a condition known as insulin resistance. High insulin levels lead to weight gain and don't go away with thyroid hormone replacement. This might be the strongest connection between weight gain and hypothyroidism and also the most underappreciated. Bringing up leptin to your current physician is likely to be met with a puzzling look and a quick change in conversation. Most physicians simply aren't trained in how to deal with or manage leptin. Despite this, the connection is very strong between altered thyroid states and leptin resistance (4). Hypothyroidism leads to leptin resistance and further weight gain aggravates existing leptin resistance (5). Leptin is a powerful hormone secreted by your fat cells that act on your hypothalamus (brain) to regulate your metabolism. This means your resting heart rate, your energy levels, the number of calories you burn at rest and your body temperature. ​What's worse is that high leptin levels actually make thyroid function worse as well. Bottom line: Low thyroid hormone leads to leptin resistance and weight gain. 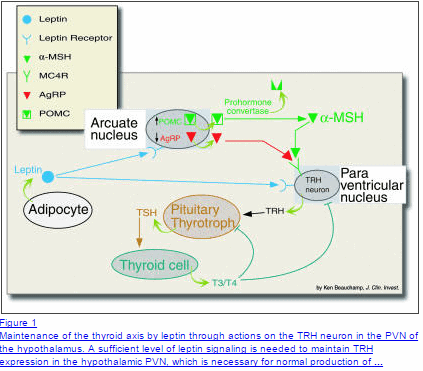 Leptin levels decrease thyroid function by reducing T4 to T3 conversion and making hypothyroid symptoms worse. Most physicians miss this condition. ​Again, another missed connection between hypothyroidism and weight gain. Testosterone is required (in both men and women) for proper regulation of skeletal muscle mass, energy levels, maintenance of libido and mood. Low testosterone levels lead to weight gain and many other symptoms, especially in women. Studies have shown that low﻿﻿﻿ ﻿﻿thyroid hormone leads to low testosterone (6). This is particularly important from a weight perspective because of testosterone's influence on skeletal muscle. The more muscle mass you have in your body the higher your resting metabolic rate will be. 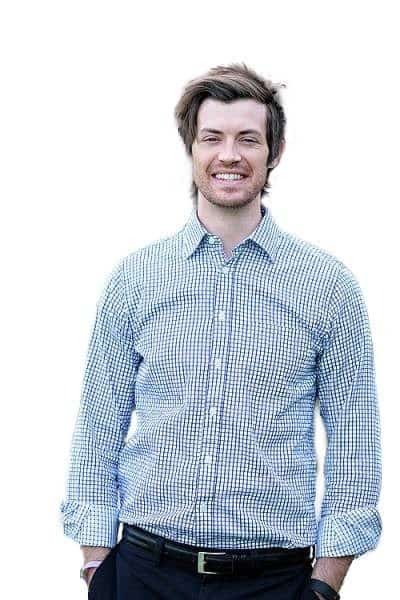 ​So the drop in testosterone levels results in a drop in skeletal muscle which lowers your metabolism. Replacing thyroid hormone doesn't always correct the low testosterone levels. 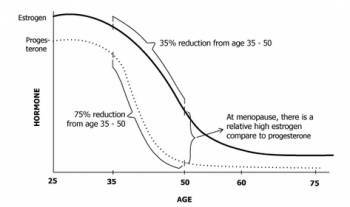 Low testosterone may be worsened by insulin resistance (which doesn't go away with thyroid treatment) and with age/menopause. Bottom line: Low thyroid hormone leads to low testosterone. Replacing thyroid hormone may not result in an increase in testosterone levels meaning you may need additional supplementation of this hormone. This one is different from the rest because many times treating low thyroid can actually improve progesterone levels and reduce symptoms of high estrogen. What symptoms am I talking about? These symptoms all result from the imbalance that occurs from a drop of progesterone. It's helpful to think of estrogen and progesterone as yin and yang. While estrogen helps build up endometrial and breast tissue, progesterone does the exact opposite. For this reason, it's necessary to have a balanced ratio of progesterone to estrogen (including estradiol, estriol, and estrone). Even if your estrogen levels remain constant and your progesterone levels fall you will be subject to the symptoms above. This has to do with the change in the proportion NOT the overall lab value. And low thyroid helps contribute to low levels of progesterone (7) which can set off the chain reaction of symptoms above. The good news is that replacing thyroid hormone will often fix the progesterone level, but it may not fix high estrogen levels (this is caused by other factors). So you may have a combination of low progesterone PLUS high estrogen, and replacing thyroid hormone will only normalize your progesterone levels. Bottom line: Low thyroid hormone leads to low progesterone which will shift the balance of estrogen: progesterone in favor of estrogen causing estrogen dominance. This leads to weight gain and many other symptoms. ​Next on the list is the hormone cortisol. Cortisol is released from your body in response to stress. This can be stress from exercise, emotional stress, perceived stress and even a lack of sleep. These are all well-known conditions that cause an increase in cortisol. Let off of that list is the connection between thyroid hormone and cortisol levels. It turns out that an elevated TSH (sign of hypothyroidism) is associated with high cortisol levels (8). This could be from the stress that hypothyroidism places on your body or simply the connection between the two hormones. In either event, it is clear that there IS a connection and it's not a good one. High cortisol levels lead to weight gain (usually abdominal), symptoms of fatigue, weight loss resistance, and food cravings. High cortisol levels also change other hormones (not a big surprise) and can make insulin resistance﻿ worse (9) and elevated blood sugar. What's more interesting is that these symptoms also occur with low levels of cortisol. ​The tricky part is diagnosing the problem and getting the right lab tests (which we will discuss below). Bottom line: Low thyroid hormone may cause both low and high cortisol levels which may make insulin resistance worse and lead to abdominal (belly) fat. It is estimated that your thyroid controls about 30% of your metabolism (10). 1) This helps explain how thyroid hormone DOES influence your weight. 2) It also explains that other factors are most definitely contributing to your weight gain. Even if you reduced your thyroid function by 50% that means that your metabolism would be roughly 85% of normal​. Instead of burning 2,000 calories at rest each day you would be burning 1,700 calories per day. Now, in reality, this problem is more complicated and on average I see most hypothyroid patients with at least 30-40% metabolic damage at baseline. This means that most hypothyroid patients are burning roughly 1,000-1,200 calories per day. This helps explain why many thyroid patients struggle to even maintain their weight with constant calorie restriction. ​Part of this problem stems from a condition known as thyroid resistance. ​Thyroid resistance occurs when your body produces too much reverse T3 relative to free and total T3. This causes competitive binding between the two and results in reduced tissue levels of hypothyroidism AKA tissue level hypothyroidism (11). ​Treating this condition requires a knowledgeable physician and one that understands the importance of T3 and reverse T3. Bottom line: Low levels of T3 and high levels of reverse T3 cause a condition known as thyroid resistance. This condition results in weight gain due to a reduction in your basal metabolic rate. ​One of the easiest (though not the most accurate ways) to assess for hormone imbalances is by assessing the distribution of fat on your body. It turns out that many hormonal conditions result in a change in body fat distribution on the body and may help identify your hormone imbalance. This should be used in conjunction with lab testing whenever possible, but this does serve to help guide some patients in the event that their doctor isn't willing to order the more advanced tests like leptin, insulin, reverse T3, etc. ​While this list isn't always 100% accurate, it can definitely help guide you. I realize that many readers of my blog live in different countries where some of the therapies I recommend aren't even available. In this case, it may be useful to evaluate your body using the distribution of your body fat and then trialing treatment from there. If you are experiencing issues with weight gain or weight loss AND you have hypothyroidism then your next step is to get evaluated for these hormone imbalances. I should point out that many general physicians including endocrinologists will not have the ​knowledge to help you with these hormone imbalances so you may need to seek care from other specialists outside of the insurance model. ​Use these case studies and the other posts on my blog to help guide you. It's not impossible to lose weight with hypothyroidism (even if you feel that way right now), it just takes the RIGHT approach from the right physician. Are you struggling to lose weight with your thyroid? What has worked for you and what hasn't?